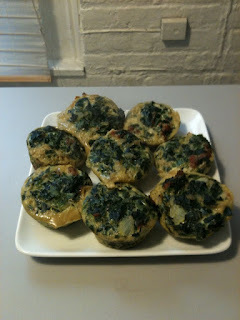 I made mini frittatas for brunch and they were awesome! They are also going to be a great snack. Mix 8 eggs with a 1/4 cup of milk in a bowl. Add some cayenne pepper. Dump sautéed spinach into egg mixture, mix well. Dump sautéed onion and sausage into egg and spinach mixture, mix well. 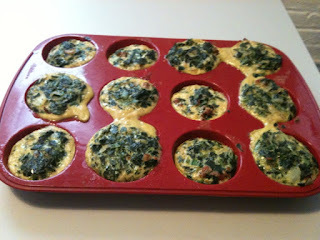 Evenly distribute egg mixture in muffin tin.